American_Dresser wrote: was she ever a maiko? every geiko was once a maiko. Not true. There is no requirement of this. Is there more respect tied to the fact of being a maiko first, yes. But as I said, it isn't a requirement. That is not the same Umeha--the maiko is from Gion. Umeha the geiko is from Kamishichiken. Also, I believe her name IS Umeha. Melissa accidentally put Umewaka when she first posted the picture. Umeha is so lovely! I adore her eyes! Maiko-san wrote: every geiko was once a maiko. Actually, some enter the flower and willow world too late to be maiko, but these tend to be jikata geiko rather than dancers. 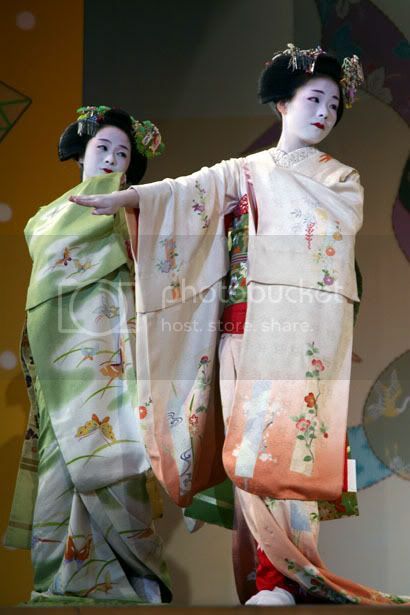 I wonder if an exception would be made for an older dancer to go through the maiko stage? was she ever a maiko? Hi! I found a new to me video in Japanese showing a master making Tsunami kanzashi from dyeing the silk to the finished product. Stunning and beautiful! She is stunning! Is she tying her obiage yet? In that last picture you posted ChoChoSan, it looks like Kyouka has aged about 10 years! I hope she is doing okay! As for Satsuki, she looks amazing! Hopefully her erikae is coming up soon! She is a beauty indeed and I love her name. She will make a lovely Geiko. I'm certain they are made of two-pointed-petals-together-per-full-petal, since i made some that way that look the same. If not, one can still make identical petals with the method. I think each petal is made from two pointed petals, glued together. Ahh, the Silken-Moon. :) That's what her geimei means. Literally: Luna-chan in a kimono, lol. She's very lucky, being a local she's been hanging around a lot longer than other shikomi. I truly hope she's going to do well. She's very pretty and indeed she looks mature. Her minarai kanzashi is so cute. Yay Luna-chan, she's unbelievably gorgeous for a (quite) new Maiko! that's one way to do it, or you can put a tiny bit of glue in the center where you're going to pinch it. ( I use fabric-tac). Both ways seem to work well. Yes, how do you make the little notch and make it stay, for sakura tsumami? Do you just pinch it with tweezers and hope that the starch will hold it? Pinch it and add more starch?